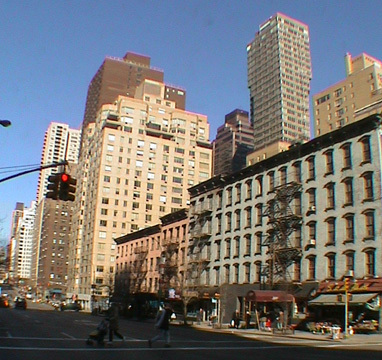 This giant, trapezoidal, through-block, apartment tower radically departs from the city's regimented building alignment with its rectilinear midtown grid. 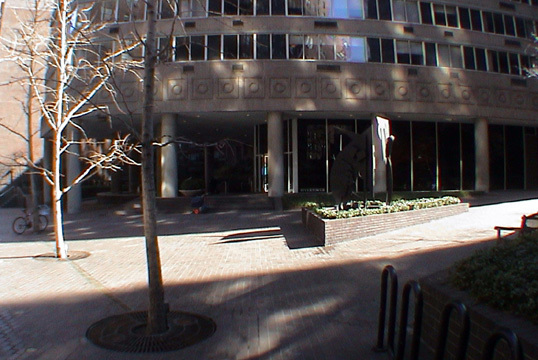 Its long facades are at 45 percent angles with the sidestreets and the tower is set back from 54th Street with landscaped plazas on either side of it. More interestingly, it is bigger at the top than at the bottom, an exceedingly rare high-rise phenomenon. Its bulges provide dramatic bay windows for the highest, and most expensive, apartments, and give the building a less than svelte, but very powerful profile. 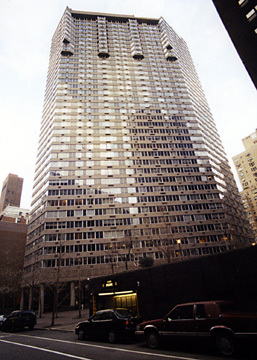 Developed by Harry B. Macklowe, this 38-story building was erected in 1981 and was designed by Schuman Lichtenstein Claman & Efron with Rudolph de Harak. It has 324 apartments. Despite its architectural bravura, this building's pale beige masonry and glass facades are a bit of a letdown, a cheapening of an otherwise very important project. The banded window pattern works well, maximizing residents' views and somewhat minimizing the building's very large bulk. If only the base of the building at least had some more impressive facing such as a dark red or green polished granite, this would be a more impressively monumental development. 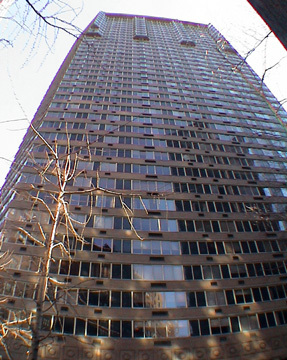 As it is, nonetheless, it was a precursor of Macklowe's more famous Metropolitan Tower on West 57th Street, a black reflective glass tower whose main tower is also slanted rakishly. It is interesting to note that this building preceded Edward Larrabee Barnes's IBM Building, with its famous angled facade facing southwest, on Madison Avenue at 57th Street by two years. 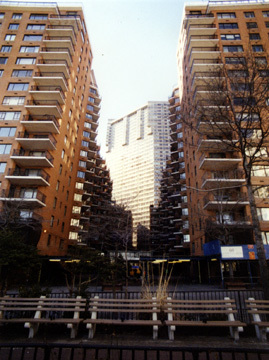 This was one of several huge "luxury" apartment towers of its period that crammed hundreds of apartments into massive structures with a full complement of building services, but relatively little in the way of true luxury detailing or spacious layouts. Still, such blockbusters provided stupendous views for their residents and a burgeoning new East Side skyline. 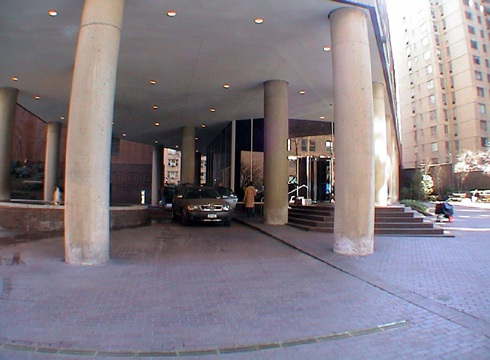 The building has a free health club, garage, valet service, concierge, doorman, bicycle room, storage space, a wine cellar, and it permits pets. 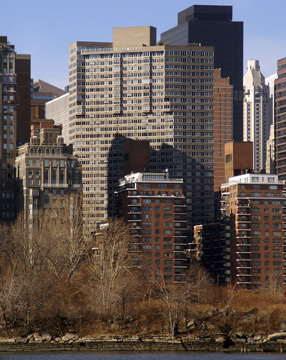 Although a midblock building, much of Macklowe's site fortunately faced east to the East River between the wings of 60 Sutton Place South, providing more waterfront vistas. If all buildings were to slip and slide and play diagonal tricks on their sites, Manhattan would lose much of its character that is heavily dependent upon the grid for convenience and uniformity. The occasional exception, however, can be very dramatic. When seen from south on First Avenue, River Tower appears to be a colossal oceanliner run amok, or at least ashore, on the almost puny cliffs of the small isle of Manhattan. In concept, this is a dynamite and very impressive building. In reality, it's intimidating and not chintzy enough, but then power buildings don't look good in chintz.